The weather's just getting better to start doing a few things outdoors. 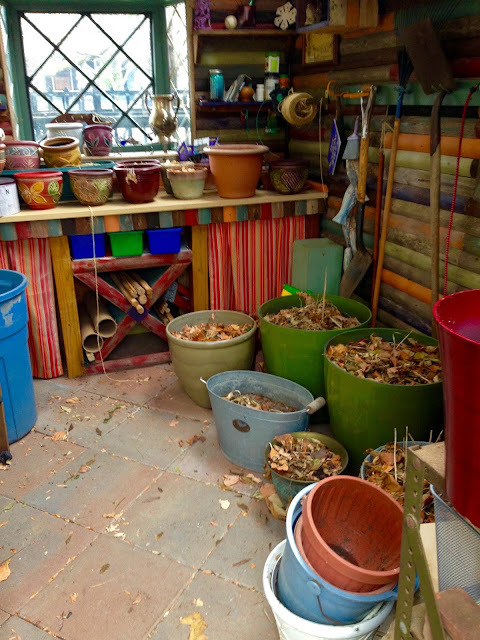 Today I moved the plants stored in the potting shed for the winter outside. It's mostly hostas in pots, but I want them to et rained on and reinvigorated before tehy dry out and die. I also decided I had to do something with the file cabinet of tax documents from the 1990s. 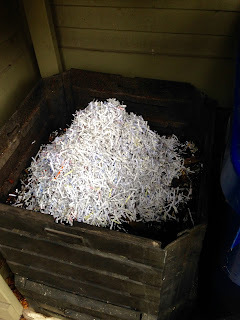 It doesn't seem to be a gardening sort of thing, but I bought a paper shredder and my daughter shredded our piles of tax back-up paper work that we no longer needed to store. For the better part of her Christmas break from college, she shredded hundreds of sheets of paper. And then I added my taxes to my compost bin. The paper shredded was only black ink on uncoated paper. 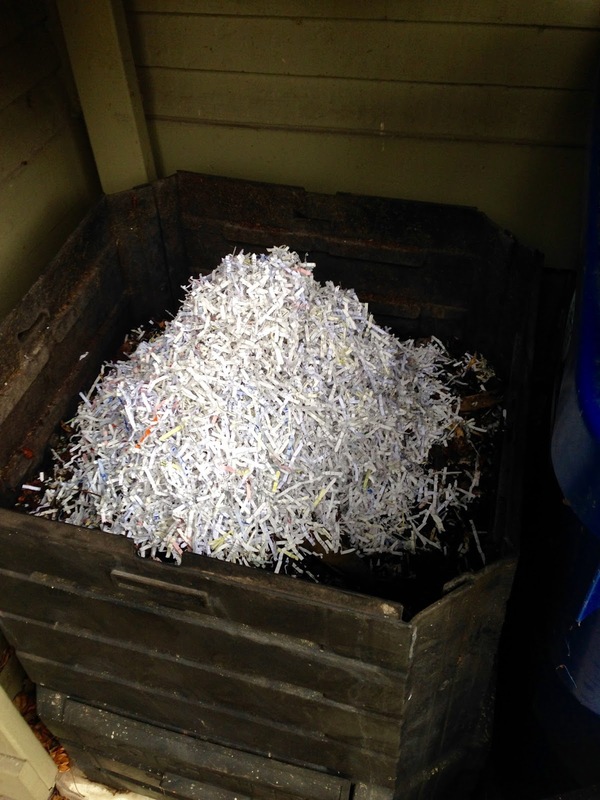 I know you shouldn't shred coated/glossy paper with color ink, I believe because of the chemicals from the ink and paper processing. Everything's decomposing nicely. The paper adds some bulk to the compost, not sure how much nutrients it adds. But, hey, it's tree bits, so it can't be bad. 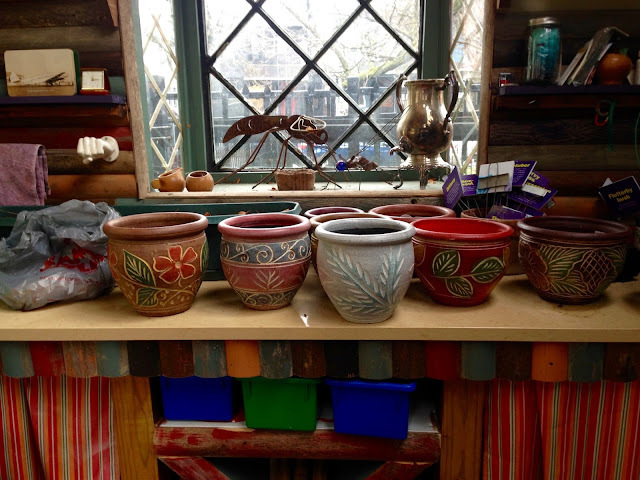 My wife also found all these beautiful pots seen in the top photo. 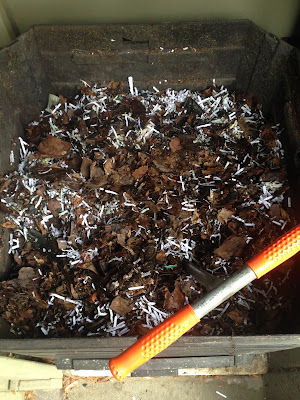 I used this photo for the lead photo, only because shredded paper in compost does not make for an appealing image. She bought them for only a couple bucks each at the Christmas Store, a store I'd only ever been in with my mother years ago. I'm told they have much larger clay pots. I may have to go check those out. These will get filled with hostas and also some of the annuals I've over-winterd in the basement. 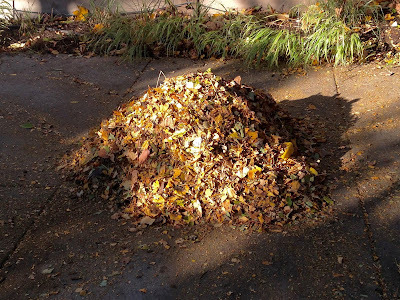 the majority of the "dry" material in the compost. I also took the burlap cover off of the vertical succulent garden. Lost a few more hens and chicks. I tend to lose about an eighth of them each year over the winter. I'll have to order another batch of them to fill in the blank areas of the frame. Also noticed the top section of the wooden frame is rotted. I'll have to replace that. Not much else to report on the garden - other than the tulips, hyacinths and Siberian iris are all starting to pop up. Taxes mix in well with compost. It's all hostas, and they get stored here over the winter. Looks kinda' rough, but in a couple months, and with some new hens & chicks to fill in blank spots, it'll look like a million bucks. Love the eclectic way you make compost and all the thought behind it. It is discribed with good humor. Particularly interesting also because you live in a part of the country with severe winters. I am from the Northeast also. 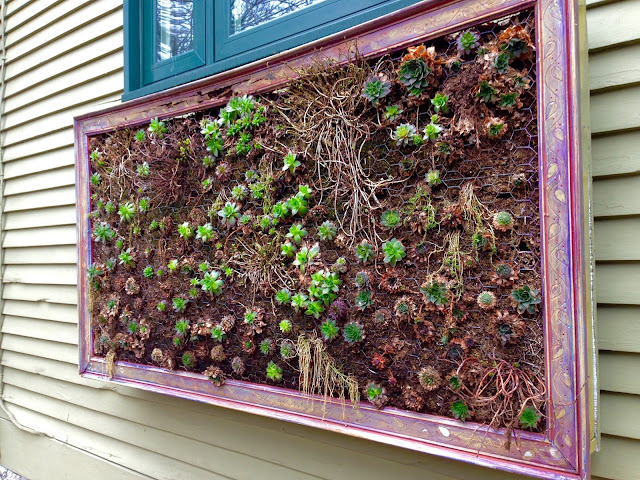 The succulent frame is wonderful even without the new hens and chicks. Look forward to seeing it revisited by you. You have indeed found an art of gardening.